Are you looking for any government or teaching jobs? Here is something for you! Chhattisgarh Professional Examination Board Raipur (CG Vyapam) has opened its recruitment for the fill 14,580 vacancies. The recruitment is for the posts like Lecture, teacher (Shikshak), Assistant teacher and various others. The candidates may visit the official website and look for the different eligibility and the interested ones can apply for the postings on or before 25th April 2019. The application link is open in cgvyapam.choice.gov.in from March, 26th 2019. The candidates must have completed the required qualifications and should perform well in the recruitment process, written test and personal interview. It is also important to apply for the job through the proper channel and to make payment through a proper channel. With such efficiency and in the age limit of 18 to 40 years can apply for the job. The aspirants should also be updated with the registered mail ID, phone number or the official website for further information like the exam date, venue, results, postings, other vacancies, etc. The candidates looking for complete vacancy belonging for different categories can check the official notification. Higher Secondary/ Degree/ Diploma/ B. Ed/ TET/ B. Sc. Ed/ BA. Ed/ other equivalent from any of the recognized board/ university/ institution can be eligible. Mode of Payment: The candidates applying for the CG Vyapam Teacher and Lecture Vacancy 2019 may apply through any of the online medium of payment like credit card, debit card or net banking. For the specific age limit and relaxation of age for different categories, the candidates may check the official notification. Step 2: Open the official notification and read them completely, look for the eligibility of CG Vypam teacher jobs and for different posts. Step 3: When you are eligible to apply for the post open the link, log in and fill the necessary details. Check and make sure that all the information given by you is true and upload the documents that you required to submit. Step 4: Make payment through online mode using your credit card, debit card, or net banking and complete the registration process. Be updated with the registered mail ID, Phone number and official website for further information regarding the recruitment process and the upcoming vacancies. 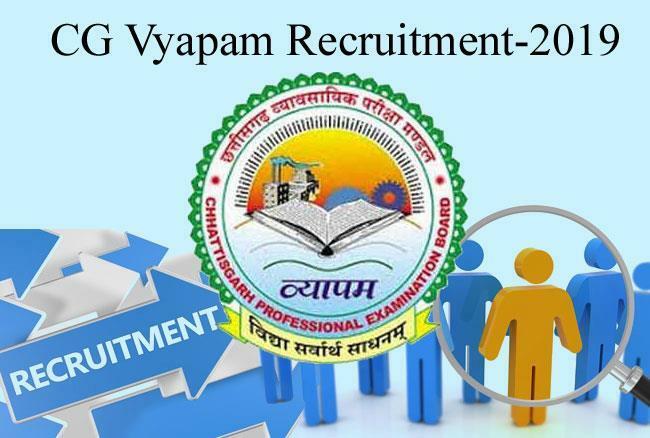 Selection for the post of CGvyapam Recruitment 2019 will be based on the performance of the aspirants in the written exam and the interview.